Service Costs > How Much Does it Cost to Lift a House? How Much Does it Cost to Lift a House? Lifting a house is a very common procedure done in order to avoid flood damage, add a basement, fix the foundation, add head space or even move a home from one place to another. On average, you can expect to pay anywhere from as little as $20,000 to more than $100,000+ Since there are so many factors involved, as mentioned below, the range can be quite large. According to our research, a lot of costs may be involved, and since every situation is unique, the prices will vary, but with our table below, it can hopefully help you understand what you may be paying for this type of job. Geekazon.com did a great job showing us what they had to essentially raise their house. In the end, the total costs easily surpassed the $130,000 range, but according to the pricing, it did include a new home addition. An experienced contractor on Angie’s List answered this very question and said jacking/moving a home can be in the $30,000 to $40,000 range, while a new basement could cost around $40,000 to $50,000; however, he did see homes cost as much as $70,000. The larger the home is, the more it will weigh; because of this, the process can be more complex, adding to the overall price. Like the size of the home, the more floors a home has, the more weight that needs to be raised. More weight will equal heavier machinery. If your home just flooded, for example, then there’s a good chance there will be damage done to the foundation. Whether it’s on the foundation or within the drywall, this can make the process a bit more complicated since lifting the home can be deemed more fragile. Depending on the company lifting the home, they may require you resolve these issues before they even consider the job. 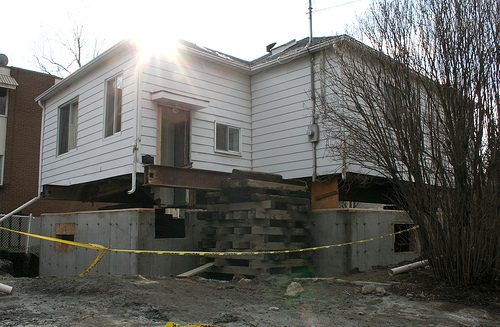 If you’re lifting the home due to a damaged foundation, then it could be due to bad soil or even earth movement. If you’re not moving your home to another location, then the company will need to use concrete piers to create a new foundation, ultimately increasing the costs. But, if your foundation is in great shape, then you won’t have to worry about this, saving you a good $5,000 or so. With any professional contractor-based job, time is money. If you need this done as an emergency, this it could cost much more than if you were to wait during the contractor’s slower seasons. Every geographical location will have varying fees when it comes to the permits. Since every city will require a permit for this job, it’s best to budget at least $2,000 to $5,000 or more. All contractors will have varying labor fees, and since no one will work for free, each contractor will have their own rates. While there is no set standard labor costs, the best route to find out the costs in your area is simply by getting multiple quotes. With some projects, according to those who have had the job done before, homeowners have stated an architect may be necessary to create specially designed plans. If one were required, this could be an additional $3,000 to $6,000. Chances are your landscaping will need some work with the job is complete. Depending on the circumstances, it’s best to, at a minimum, plant grass and even replace plants/shrubs that were there in the first place. As noted in our table above, you may find yourself repairing many cracks on the drywall after the home has been successfully lifted. Contractors don’t recommend living in the home while it’s being lifted, so you may have to budget for accommodation purposes. With this type of job, you’re going to need the help of an architectural/structural engineering firm before you even consider a contractor to make sure this is the best course of action. Depending on the job, a specialty company may be able to slide a home onto a new foundation or jack it up while on steel beams while a basement is dug out beneath. Robert at OldHouseCrazy.com, showed an effective DIY method, for example. When hiring professionals, it’s best to know a few things before hiring. First off, you will want to know how many homes they have lifted and/or moved in the past. You never want to be the first home they mess with. Secondly, ask for references to see what other homeowners say about their workmanship. Ask them how long it took, how they communicated and what they didn’t like about the process. Lastly, make sure the company has liability insurance and know their limits. A good company will have coverage of $200,000 at a minimum. In most cases, you’re better off adding an addition if you have the room rather than raising the home to add a basement. Unless you’re raising your home due to flooding or foundation issues, it just doesn’t make sense financially to do so. Finding quotes in your area can be a challenge, but it doesn’t have to be if you use HomeAdvisor.com. Here, you simply describe your job and multiple licensed contractors in your area will contact you with ballpark quotes.